Happy Birthday to Savannah Phillips! The daughter of Peter and Autumn Phillips celebrates her eighth birthday on December 29. The Queen’s great-granddaughter has certainly earned a reputation for being our cheekiest young royal over the years – particularly at 2018’s Trooping the Colour, when she stole the show by teasing her cousins Prince George and Princess Charlotte, and pulling some hilarious faces! 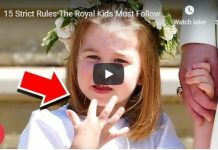 Savannah – who is the Her Majesty’s oldest great grandchild – also showed just how sassy she is, as Twitter went into meltdown after she put her hand over George’s mouth to keep him quiet. Take a look through all the best moments Savannah made her mark during the annual celebrations – and a few extra for luck! Savannah looked like she was trying to reach out and touch the planes during the flypast during the Trooping the Colour celebrations in June, but unfortunately the Queen’s great granddaughter just quite wasn’t tall enough! Savannah certainly has a fan in cousin George! 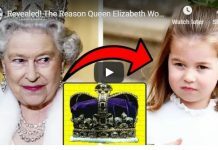 The seven-year-old kept the little boy well and truly entertained as she made faces as they stood on the balcony of Buckingham Palace with the rest of the royal family. 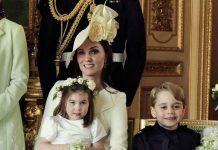 When Princess Charlotte fell over on the balcony, Savannah – who is big sister to Isla, four – showed her caring side, and was seen helping to comfort the little girl along with the Duchess of Cambridge. Between them, Charlotte was soon cheered up and back to watching the planes. Savannah just couldn’t believe how spectacular the planes were, and she certainly gave them her full attention! 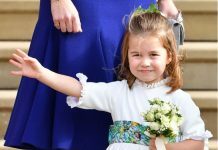 The eight-year-old looked up with delight as she stood between cousins Prince George and Princess Charlotte on the balcony. Savannah pointed out to the planes with delight as she stood on the balcony of Buckingham Palace with the rest of the royal family. Savannah nearly broke the internet after she was pictured telling Prince George to be quiet during the ceremony. She wasn’t afraid to tell her little cousin what to do, and he didn’t seem to mind either! Savannah delighted royal fans even more after putting her hand over Prince George’s mouth to quiet him down… after her attempts at shushing him didn’t work the first time! Savannah definitely wins the prize for the most excitable royal as she reached out her hands with delight during the flypast. The little girl showed off her cheeky side once again and was seen sticking her tongue out, too! When Princess Eugenie’s official wedding photographs were released in October, royal fans were quick to spot that Savannah made a seriously cheeky move in one of the photos – by standing on Eugenie’s dress! She seemed to make up for it in the ceremony, however, sweetly taking the bride’s bouquet for her as they arrived at the alter. What an adorable moment. Savannah tried to make George laugh by mimicking the trumpeter during the royal nuptials, but he was having none of it – clasping his hand over his mouth to stop himself from giggling! Naughty! 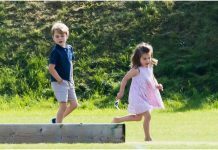 The eight-year-old was told off for pushing Prince George down a slope during the Maserati Royal Charity Polo Trophy at Beaufort Park in June. Mum Autumn Phillips had some stern words for Savannah, and poor little George had to be comforted by Duchess Kate, who was quick to cheer him up. They were soon friends again, however, as she sweetly ruffled George’s hair. Aw! Previous articleWhat Are Prince George, Princess Charlotte and Prince Louis’ Zodiac Signs?